When Saturday Night Live famously revived itself with the wonderful "Lazy Sunday" parody rap, they brought one of the biggest trends in baking to the mainstream: Cupcakes. The Magnolia Bakery, New York's go-to source for cupcakes of every description, has lines outside until close to midnight, and they limit purchases because of their popularity. As popular as cupcakes are, it was perhaps inevitable that they'd crossover into wedding receptions. At first, couples served them as an additional dessert to complement their more traditional wedding cake, and that's still a very popular trend. But eventually, of course, the mighty cupcake juggernaut rolled onward and you can now serve your guests a cupcake wedding cake. 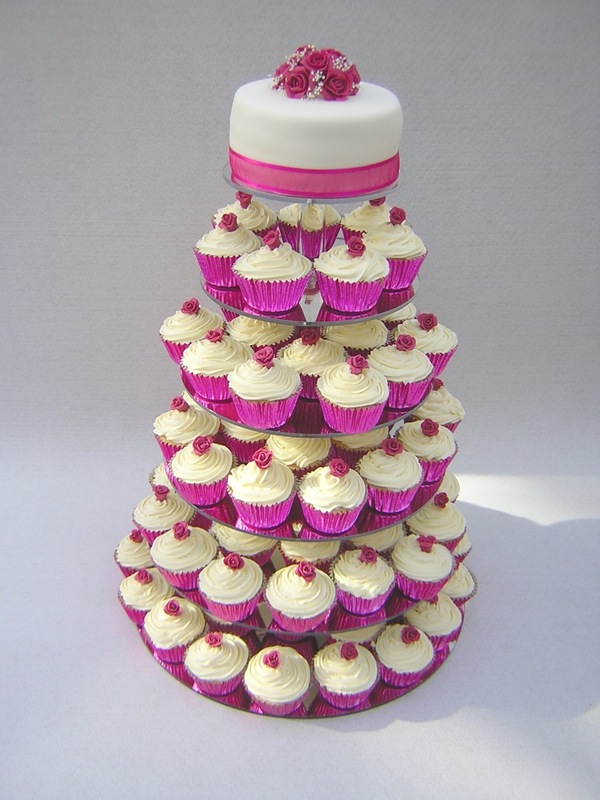 This clever concoction is created by using specially designed cupcake stands which give an effect of a tower, tree, or pyramid. Each cupcake is individually decorated, and the cumulative effect can be quite lovely. You and your wedding cake designer might choose to go with a single color, for a dramatic and monochromatic effect, or you could instead have a fun multi-colored cupcake cake. One of the great advantages of a cupcake wedding cake is the freedom it gives you to have a variety of different flavored cakes. Unlike a traditional cake, you don't need to deliberate over whether you prefer an amaretto-raspberry cake, or a more classic vanilla: Have both, and while you're at it, add some cappuccino, banana, and chocolate-mint cupcakes too. 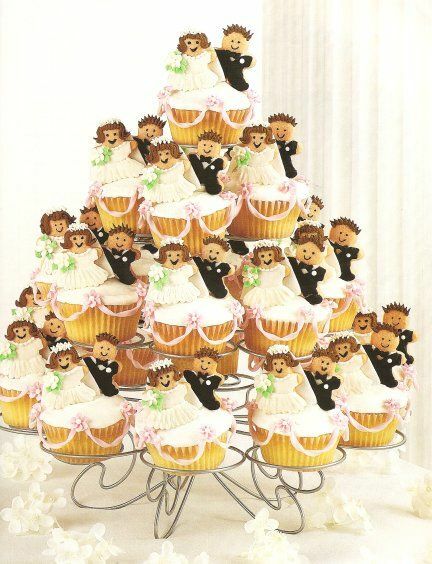 A cupcake wedding cake also offers other benefits as you plan your reception, particularly if you're on a budget. Prices for cupcakes are between $1.50 and $3.00 each. Wedding cake however, which is usually priced by the slice, can easily cost twice that much per portion. Cupcakes are also much easier to serve, although you do lose the opportunity for a photo of the ceremonial cutting of the cake. If that's important to you, plan to order a small traditional cake, which is supplemented by matching cupcakes. Originally a New York phenomenon, cupcake cakes are now commonly available everywhere. Consider ordering one for your wedding and give your guests a small, but perfect, taste of matrimonial pleasure.